The 17-track record features bits with titles like “I’m the Worst at Jiu Jitsu” and “I Grew Up in Newark and Got Robbed in Paris.” Inspiration, he says, comes from real life. “Usually something embarrassing happens, and when my mind says, ‘Don’t tell anyone about that,’ it clicks and I say, ‘I need to tell everyone about that.’” Though the titles and the routines suggest Stone wants you to dislike him as much as he seemingly dislikes himself, you can’t help but like Greg Stone. And, behold, the beauty of self-deprecating humor. Something about him is warm and somehow honest, a trait oft-admired in many of comedy’s greats. “I love comedy. I love the art of stand-up. Bill Burr, Brian Regan, Bernie Mac–mostly comics with B names. But above all else, I love this comic Dan Shaki. I admire him the most for one reason–he’s not funny. He has never been funny and yet he keeps going. That’s inspiring–to truly be as unfunny as him, and yet he gets up every morning and finds a way to do it,” Stone says. “You might be saying ‘does he get by on his looks?’ No. The guy has a head like a rotting tomato, yet somehow he’s managed to sell a pilot, work all the clubs even get on HBO’s Crashing. I mean, it’s easy to do comedy when you are funny, but when God hits you in the face of with the fastball of no talent and you still manage to get a career–my Lord, that is something to admire.” Dan Shaki, as it turns out, is a friend of Greg Stone’s, a fellow Gotham Comedy Live album, and a man he certainly doesn’t hate. 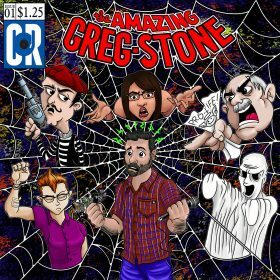 The Amazing Greg Stone, complete with Spiderman-inspired artwork designed by his brother, can be heard on iTunes and any streaming platform. 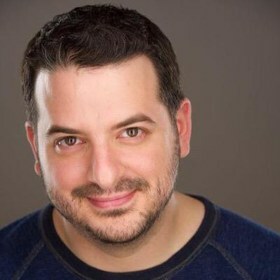 To hear more of Greg Stone, check him out as the co-host of The Rad Dudecast with Anthony Devito and Brendan Eyre.